Week Forty-Four: Multi-Grain Breads Happy Halloween! I love Halloween. I’ve always enjoyed any excuse to dress up in costume, giving sides of myself usually kept under wraps a chance to emerge a bit, under the protective hand of “staying in character”. Maybe it’s a result of growing up in New Orleans, where people don costumes just because it’s Tuesday, but I’m always a little happier when I have a Halloween costume planned. It’s in this spirit that I bring you today’s bread. Pumpkin must be one of Fall’s more virtuous foods, with its wealth of nutrients, its endless adaptability in the kitchen, and not least of all its ability to remain delicious after the commerical canning process. But for today, pumpkin sheds her wholesome and respectable air, and puts on a more scandalous costume. It’s one that is sweet and indulgent, studded with dark chocolate, and fragrant with heady spices. Each crumbling slice tenderly falls apart in your hand, and the fantastic flavor will have you diving to catch any piece that may fall before it hits the floor, lest you have to throw any mote away. This bread was suggested some months back by a friend who insisted I save some for her, should I make it, describing it as her all-time favorite bread. I’ve been planning it ever since then for this one day, as it seemed the only appropriate choice. (Do I have to mention the color scheme?) 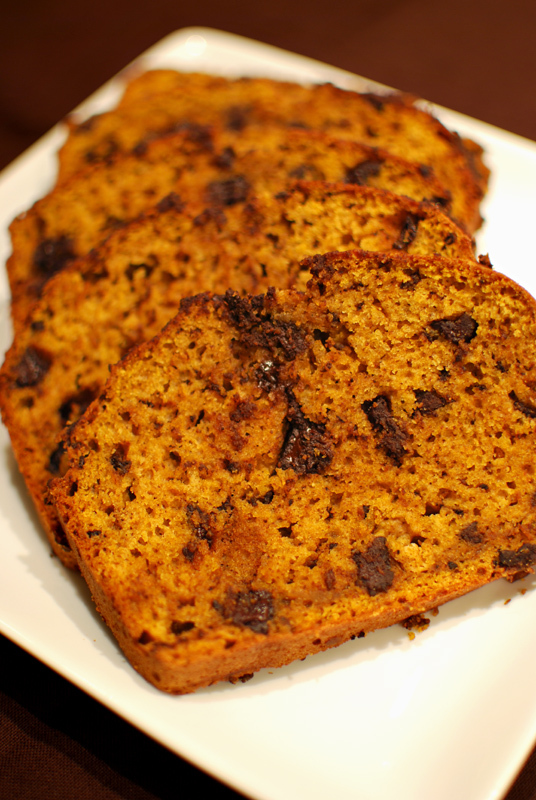 Oddly, I don’t think I’ve ever had pumpkin chocolate bread before; Autumn baking tends to be either pumpkin or chocolate, not both. But the result is earthy, rich, spicy, a little mysterious, and just plain fabulous. The sweet-savory flavor of pumpkin, paired with the bitterness of a good dark chocolate, is both potent and elegant. But with generous measures of cinnamon and ginger added to the mix, it becomes eye-rolling good, conjuring haunting notes of Thanksgiving pies and Mexican chocolate. No, this isn’t the pumpkin I know on every other day of the year; but if this is the sort of costume she puts on, I might have to throw more costume parties. 1. Preheat the oven to 350º F, and position a rack in the center. Butter a 9 x 5 inch loaf pan, and line lengthwise with a piece of parchment long enough to extend one inch beyond the sides of the pan. 2. In a medium bowl, whisk together the flour, baking soda, spices, and salt until thoroughly blended. In a large bowl, whisk the eggs and water together. Add the sugar, and whisk until blended. Mix in the pumpkin, oil, applesauce, vanilla, and bourbon. 3. Add the flour mixture to the wet ingredients, and fold together with a nonstick spatula until nearly blended. Add the chocolate, and gently fold in until incorporated and no large pockets of flour remain. 4. Scrape the batter into the prepared pan, and smooth the top. Bake at 350º F for 55 to 65 minutes, or until golden brown and feeling firm when pressed gently in the center. Remove from the pan by pulling on the parchment, loosening the bread from the sides of the pan with a thin knife if necessary. Discard the parchment, and let cool thoroughly on a wire rack before slicing. 1. Chocolate chips are perfectly acceptable, but I prefer the irregular pieces and melting quality of chopping up my own bar. 2. For the best slices, let the bread cool completely before cutting, giving the melted chocolate a chance to cool, and the structure of the bread to set. 3. This bread will keep for about 2 days at room temperature, wrapped in plastic, or may be frozen, tightly wrapped.